I mentioned previously trying to have events that make a city feel different than the rest of the world. After many delays and several sidetracks my players got to witness, and take part in, a religious procession of barges that determines which religion will be dominant in this city for the year to come. The city they are in is a dingy, trade-oriented republic. Ulminster has five big families that struggle for power and religion is party of that. 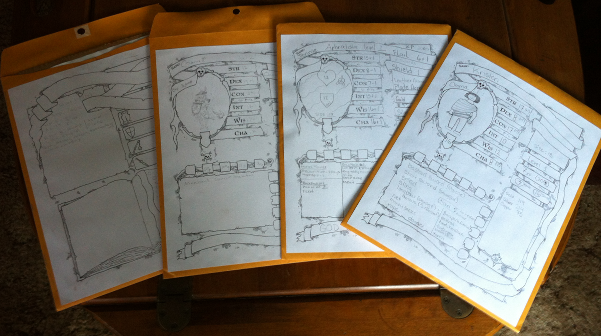 First, here's what my new take on character sheets turned out like. I ended up using one by Dyson Logos' sheets and deleted a lot of the labels. I also rearranged the stats (I like mine grouped as physical/non-physical rather than the random traditional order). So it wasn't a collage, but since everything was pretty much unlabeled spaces of varying sizes, my players each chose what they wanted to put where. I think that's pretty cool. We also had one visitor join and I just rolled him up on an index card. I figured if he comes back we can migrate to a folder like the rest. The idea is that The Regatt Gloriosa is a festive event sort of like Mardi Gras. Citizens each get one clay chip from their neighborhood. These chips have a hole threaded with a ribbon and are thrown onto the barge passing that the citizen prefers. There were five neighborhoods that border the city's central river. A majority of these had to be won to win the regatta. My one player decided to build a float and take part int the Regatta, so I designed a mini-game to represent it. I set it up as five hands of cards, but playing off of three shared cards. Two of which were hidden until we moved into that region. I was playing the frontrunner and expected winner (the current Doge representing the biggest religion). I didn't want to involve the other barges for simplicity's sake, but also because I didn't want to set the mini-game up as a competition between my players. So it was him versus me, the DM. That's also not a good situation to be in, an adversarial DM, but I tried to alleviate that by giving him a session to creatively acquire some advantages and I went first so he could react to what I did. So my player and I started with 10 cards each-- enough to complete a poker hand for all the districts. My player, G, had earned another card in a previous session by buying thousands of meatpies for the onlookers in one neighborhood. He also spent money to set up fireworks on his barge. He had enough to shoot them off twice and could draw an extra card for the particular neighborhood he shot them off in. So, when the regatta moved into a neighborhood, I flipped the two hidden cards and had the Doge play first. It was iffy if this design was going to work-- I didn't want my player to win or to lose, but for there to be exciting tension. And the way it worked out we went into the last neighborhood tied, so it worked perfectly. My player won. The Captain (as in Morgan) is now the dominant religion in Ulminster for the next year. So what did I do with the rest of the players while only one was involved in the regatta? Well, I was trying to bring in threads from former sessions. So, Oma the female fighter took part in smuggling weapons into the city for the Redsashes (the local hireling guild) in a previous session, because they expected an attack. Aphrodisia, the female cleric, sees the future in dreams and she saw people jumping from a bridge to attack a barge. There happen to be three bridges. The players set up on the middle bridge and then had to run frantically to the last bridge when the attack occurred from there. From a previous session Aphrodisia knew her grandfather was going to be killed by being fed some serpent-like thing and she saw one of the women from that dream on the barge of a new religion. This is me trying to set up for them having to deal with a weird serpent cult in future sessions. The final battle was nothing complicated by D&D standards, they were pretty much low level thugs. The party was never really in danger. But the thugs were attacking lepers that G had converted to the Captain's cause, so there was some tension trying to save those unfortunates. You can see dice representing the lepers and their hit points below. The glass beads are the thugs. I let my players roll attacks for the lepers so they were all involved. At the end, it was very satisfying, the regatta went off as planned with fireworks, nailbiting, and a photo finish. Everyone clapped when we finished. We had two people watching and one of them was really getting into it and my players were trying to convince him to play next time. Excellent, remembering the timeI hacked together a mini-game to deal with a chariot race the players were spectators at. Hey, thanks to both of you.